I recently bought this beauty on eBay. When I arrived I was a bit disapointed to see that the hinge that makes that click-clack sound was not operating properly. I really hate the stupid eBay feedback system which makes minor complaints not worthwhile (nobody wants a negative comment in retaliation for reporting an incomplete or dishonest description, right?). Hmmm, maybe that’s the point. Uh well, still, it was a good deal for $15. 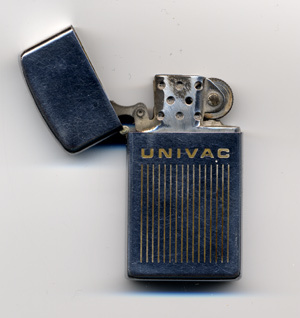 “Any Zippo metal product, when returned to our factory will be put in first class condition free of charge, for we have yet to charge a cent for the repair of a Zippo metal product, regardless of age or condition.”. So, theoretically all I have to do is send the lighter to the factory and they will fix it. I’ll let you know how good a job the’ll do.